We specialize in transloading, storing, and distributing international freight of all kinds. Our service is quick, efficient, competitively priced, and we offer visibility through each step of the process. Inbound and outbound transportation management. Transloading and warehousing services. Materials handling: i.e. consolidation and deconsolidation, labeling, classification. Export and import services. Export blocking and bracing. Intermodal and domestic transportation services across the USA and the most important canadian cities. Over 30 asset-based trucks and owner operators for delivery and distribution in the Midwest. Owned fleet of chassis, dry vans as well as tri-axles to scale more weight, specializing in overweight trucking moves. Our facility is central to all of Chicago’s rail ramps and we have regular availability at every rail. Our team of dispatchers takes ownership of every container and regularly traces and monitors their movement. 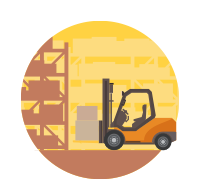 Our warehouse staff is experienced with handling all types of freight including fragile commodities, machinery, and heavy-lift cargo. Our intermodal trucking company is legally permitted to haul cargo weights of up to 57,000 Lbs. per 40′ container to help customers reduce ocean costs by maximizing container payloads. We have capability for loading flatbeds inside our building for shipments such as lumber and various steel products. 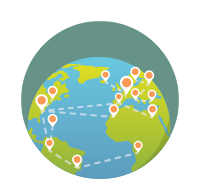 We are also very experienced with e-commerce/Fulfillment, Amazon FBA cargo, Amazon’s receiving guidelines, and we regularly deliver to Amazon DCs throughout the Midwest. We are an approved US Customs Bonded Container Freight Station (CFS) and C-TPAT Compliant Facility with FIRMS code: HAM6.